Effortlessly Gain INSTANT Access to All These Remarkable Benefits! How did Gandhi, Mother Teresa, and Jesus survive weeks without food? How did Leonardo da Vinci make advances in anatomy, astronomy, and physics that were centuries ahead of scientific discovery—and still find time to paint the most iconic picture in history? What did people like Benjamin Franklin, Thomas Edison, and Albert Einstein do to help them pioneer remarkable breakthroughs and accomplishments? They all used unique meditation techniques and mental exercises. And these days, Oprah Winfrey, Sting, the Dalai Lama, Gwyneth Paltrow, and other accomplished individuals from every background and field of endeavor do it too. Meditation is the doorway to innovative thinking, knowing, being healthy, finding calm inner strength, and... quite frankly... living happily, productively, and abundantly in this world. And—contrary to what you may think—you can do it almost anywhere... even when you’re driving! If that is true (and, based on the amazing benefits listed above, I believe it is), how do you get to those answers and insights when you need them? Why doesn't that happen more often? Or, more importantly, how can you make it happen at your command? The reason you get stuck has little to do with what's in your mind. The problem is with what's not in your mind. During most of the day when you're working, texting, emailing, driving, or doing anything active, your brain waves are primarily in a Beta pattern. But, if you want to find a creative solution to a problem or receive insights or breakthrough ideas on a challenge you're facing, your brain needs to slow down to a Theta, Alpha, or Theta-Alpha pattern. These types of patterns occur when you're drowsy, relaxed, and reflective (but not sleepy), or in a state in which a silent current of thoughts, images, and memories emerge spontaneously in your mind. The result? You often feel overwhelmed and off-balance. How can you slow down your brain waves even when you're surrounded by chaos and stimulation? Mental focus enables you to shut out the noise that almost always surrounds you and to get calm in the center of the storm. It is the single best tool you have for releasing the power of your mind and allowing the answers, breakthroughs, and insights you seek to be heard. The best way to develop laser-sharp focus is to meditate. Meditation—in all its various forms—is supported by decades of scientific research and backed up by centuries of real-life experiences. It is proven to help you let go of all the content that generally occupies your consciousness by slowing down your brain waves. With your mind clear, you can access the knowledge that's locked inside. But, slowing down your brain waves to have a focused mind can be challenging—even for the experts! That's especially true with the stresses and constant stimulation of modern life. Now, more than ever, you need to develop ways to gain instant access to the calm, all-knowing haven that's inside your mind. Yes, I want to re-create my life in nearly any way I choose by tapping the greater powers of my mind! I want to take advantage of this limited-time special offer! Focused Mind, Powerful Mind doesn't just teach you how to set aside time to do different meditation techniques. It provides a system you can use in the real world to train your mind so you'll be able to shift into the appropriate brain-wave and mental states on demand. While you may not need to survive weeks without food or want to paint the most iconic picture in history, you will be able to accomplish some remarkable feats of your own. The reason meditation is so powerful is because you become what you think about. When you meditate, you clear away all the noise and the clutter, and your thoughts become focused and clear. So, because you become what you think about, your life automatically improves through meditation. YES, I want to become a revolutionary thinker... tap the greater powers of my mind so I can instant access to the information, knowledge, and answers that I seek... and re-create my life in nearly any way I choose! 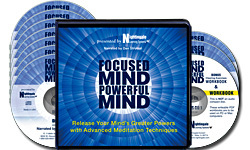 Please send me Nightingale Learning Systems' Focused Mind, Powerful Mind - including 6 CDs, 2 Bonus CDs, and a Writable Meditation Insights Journal - for just $79.95, which is $20 OFF the regular program price. Take advantage of this limited-time special discount now. If I'm not able to access the powerful insights and knowledge that are already inside of me, I can return it any time within 30 days for a full refund. No questions asked.